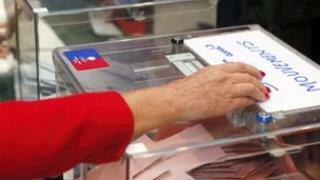 A website says it cast several votes in France's first digital election by registering under different names. A name, address, date of birth and a card payment of three euros (£2.56) are required to register a vote in the opposition UMP party's "open primary" to select a candidate for next year's mayoral election in Paris. But Metronews says it has used the same card to pay for multiple votes. And it registered once as ex-President and UMP leader Nicholas Sarkozy. Lists of local people eligible to vote in French elections are available to view by appointment in town halls, in order to ensure transparency. Web security expert Graham Cluley said: "Concerns about electronic voting systems have been around for some years. A network of electronic scanners installed across New York City polling stations to replace "lever voting machines" invented in the 1890s will not be used in this year's mayoral elections, the city has announced. The process of counting the scanned votes would be too cumbersome, the Board of Elections told the New York Times newspaper. The scanners were introduced after concerns about vote counts in Florida during the 2000 presidential election. "The old method of casting votes is really in the stone ages in many ways, but the reason why they have stayed is that they are systems people trust." Mr Cluley added that at the very least, both the web servers and software involved in running a digital election needed to be totally secure. "There's a lot of demand for speed in revealing the result, which favours electronic voting, but if you're going to hold one you better be darned sure it works," he said. Could Nicolas Sarkozy return to France's presidency?